I enjoy reading and I think that reading is a key part of growing as a person and increasing your knowledge base. I also know that there is a sea of non-fiction and technical books that are available to any developer with an Amazon account. I often find it hard to determine what books to read and in what order. So when I do find a great book, I feel the need to share it. 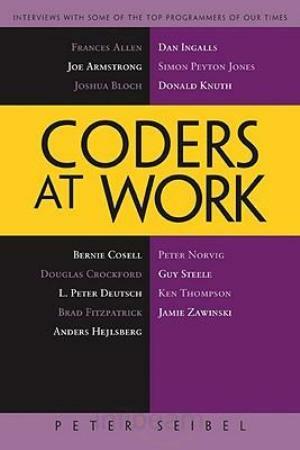 I (not so recently) read a great book by Peter Seibel called Coders At Work. This book offers an incredible insight into how some of the world's best programmers tackle the job. I found this book to be an inspiring look into some of the greatest computing minds of our generation (including Knuth, Zawinski, Norvig, Allen, and Thompson). 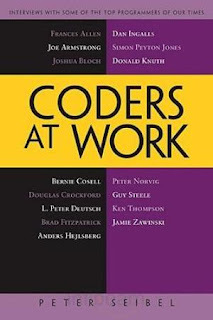 If you are a programmer and you don't already know eight out of the sixteen developers that are intervierwed in this book, you should definately consider reading this right away. Reading about how many of these great programmers work is inspiring. Peter Seibel is able to draw out the passion in these developers and bring them to life. After reading each interview, I felt as though I knew each of these people personally. This book has inspired me to become a better developer and to spend more time reading and writing code. Since I have read this book, I have taken to opening projects in Git Hub just to read the code and try to figure out what it does. This is not something I was in the habit of doing before. It has helped me to see different ways of approaching my code and has allowed me to grow as a developer. I would recommend this book to anyone who is even mildly interested in software development. I think that it has something for everyone and if you are like me, you will be moved to learn more about your craft and excited to do so!